City of southern Italy, possessing one of the oldest Jewish communities in Europe. Ahimaaz ben Paltiel in his Chronicle represents his ancestor Amittai I. as living in Oria as early as 850; Hananeel, Amittai's son, held a disputation with the Archbishop of Oria in 880; and Ahimaaz traces his family in the city down to about the year 1060. 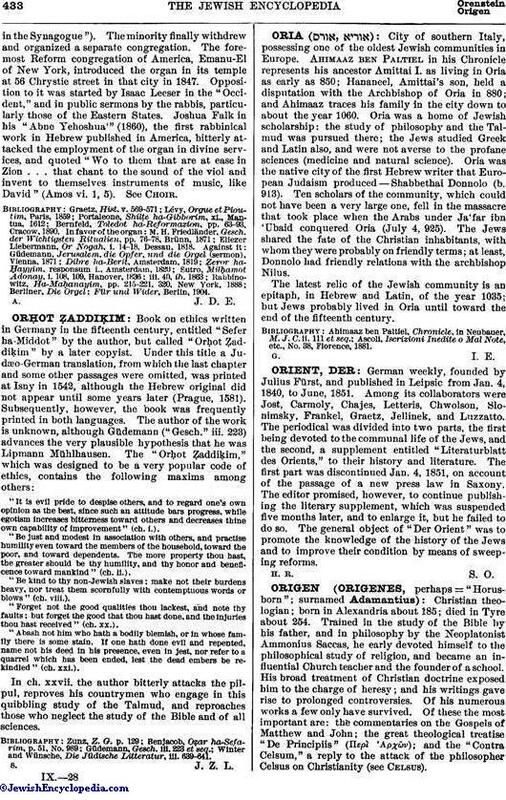 Oria was a home of Jewish scholarship: the study of philosophy and the Talmud was pursued there; the Jews studied Greek and Latin also, and were not averse to the profane sciences (medicine and natural science). Oria was the native city of the first Hebrew writer that European Judaism produced—Shabbethai Donnolo (b. 913). Ten scholars of the community, which could not have been a very large one, fell in the massacre that took place when the Arabs under Ja'far ibn 'Ubaid conquered Oria (July 4, 925). The Jews shared the fate of the Christian inhabitants, with whom they were probably on friendly terms; at least, Donnolo had friendly relations with the archbishop Nilus. The latest relic of the Jewish community is an epitaph, in Hebrew and Latin, of the year 1035; but Jews probably lived in Oria until toward the end of the fifteenth century. Ascoli, Iscrizioni Inedite o Mal Note, etc., No. 38, Florence, 1881.